I am a multi-media journalist, with an investigative background. As an eager, young news reporter, I have a creativity and passion for digging for news and investigating serious issues in the community. Contained is a broadcast video résumé tape and some of my video editing work and videography. If you have a news tip call or message me at 435-625-1044. INVESTIGATION: Fledging movie studio, or tax payer drain? 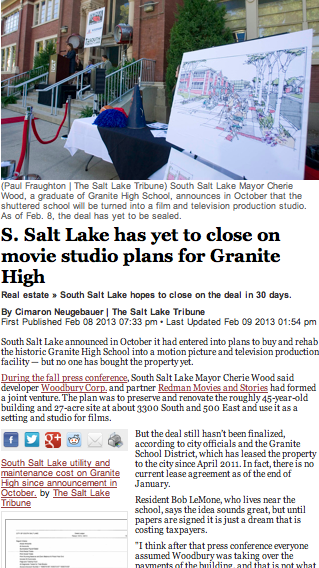 What is South Salt Lake doing with its money? I utilized some Freedom of Information Act knowledge to find out how much tax payers in the suburb of Salt Lake City has spent since the city led the residents to believe a deal had been finalized. Find out how much the indecision to buy the property has cost residents so far and see the lease agreements in the story. Click to see some of my work. Copyright 2013. All Rights Reserved.. Picture Window theme. Theme images by richcano. Powered by Blogger.